Pammy Blogs Beauty: Find Your Perfect Valentine's Day Lippie with this Fun Shiseido Quiz! Find Your Perfect Valentine's Day Lippie with this Fun Shiseido Quiz! Valentine's Day is just around the corner! Are you looking for the perfect lipstick? 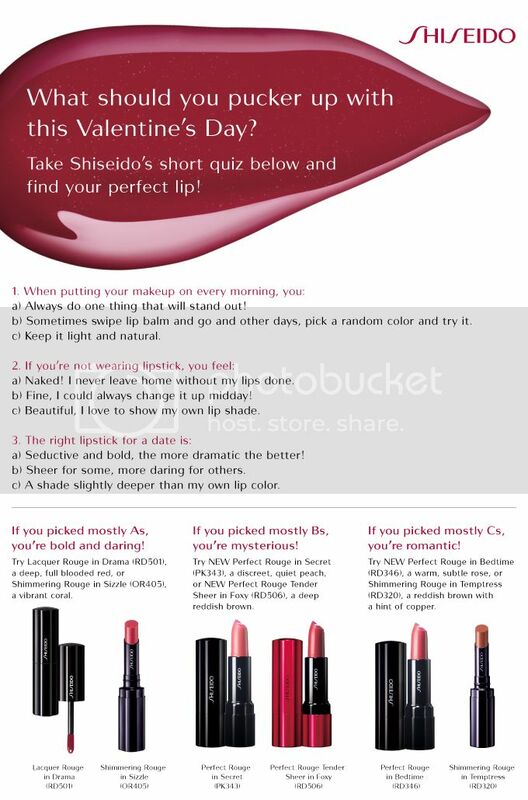 This cute quiz can help you pick your perfect Shiseido shade! I picked mostly Bs. So, I am "mysterious"! What are the results of your quiz? I got the result "Bold and Daring". I have occasionally worn a red lip into work and on my days off. I got the Romantic as a result. Those colors are best for my skin tone.